Of all the national parks of the United States, Yellowstone stands out as one of the most beautiful and iconic. Spread out across Wyoming, Montana, and Idaho, this national park was established in 1872 as the first ever national park on the planet. It was signed into law by President Ulysses S. Grant and was has always been considered to be one of the most aesthetically and naturally incredible locations in all of North America, with its forests, canyons, mountains, rivers, and unique geological landmarks like the 'Old Faithful' geyser providing a perfect backdrop for all sorts of outdoor recreation and activities like hiking, camping, kayaking, climbing, fishing, biking, and so much more. The park stretches out across a little more than 3,400 square miles in total and is home ot the biggest supervolcano in North America in the form of Yellowstone Caldera and one of the continent's biggest lakes in the form of Yellowstone Lake. Made a UNESCO World Heritage Site in 1978, Yellowstone National Park is also home to hundreds of different animal species, including several endangered species, and is considered a key location for the conservation of American wildlife, with the likes of bison, elk, wolves, and bears living in the park. Countless visitors are drawn to Yellowstone National Park each year for all kinds of activities, with many guided tours of the park being held and lots of people choosing to camp or park an RV in the area around the park in order to make the most of their trips and have plenty of time to explore its forests and admire its scenery. If you're planning a camping or RV trip in Yelllowstone National Park, you'll have a few different RV parks and campgrounds to choose from. For full details on the features and amenities of each park, as well as useful contact information, see below. No matter where you seem to go all around the United States, there's almost always KOA RV park and campground waiting to greet you. Kampgrounds of America has established hundreds of locations all around the country, with one right by the West Gate of Yellowstone National Park. The Yellowstone Park / West Gate KOA is in a great spot for people wishing to explore the park and enjoy all of its exciting recreation and adventure opportunities, and this seasonal park is open all the way from May to October of each year. The Yellowstone Park / West Gate KOA RV park and campground has received a 4.5 rating out of 5 from hundreds of past guests and features a long list of impressive amenities designed to make your stay as enjoyable as possible. Some of those amenities are big rig friendly sites, a snack bar selling a full menu of treats and drinks throughout the day, a large pavilion area to enjoy picnics and get-togethers with your friends, propane and firewood sales, a swimming pool, a hot tub, plenty of cable TV channels, free coffee and pancakes in the mornings, barbecue dinners in the evenings, a mini golf course, and a communal kitchen area. There's even a tour bus that leaves directly from the RV park each day to take you over to Yellowstone. If location matters the most to you, you'll definitely want to consider a stay at Yellowstone Grizzly RV Park. Located a very short drive away from Yellowstone National Park, while also being conveniently located near other sites of interest like the Grizzly and Wolf Discovery Center and the local Historic Center of West Yellowstone, this RV park can really help every guest make the most of every single moment of their stay. There's always something fun to do right around the corner, and the park is simply perfectly positioned for folks who want to head into Yellowstone and enjoy the mountains and rivers of the park in the day before retreating to a calm, quiet, safe location in the evenings. Yellowstone Grizzly RV Park is very highly rated due to its super amenities at friendly staff. There are no less than seven different types of RV site at this RV park, with some offering forest views and extra shade, while others are simpler and more affordable to suit travelers who want to stretch their budgets and get the most value. All sites come equipped with 30/50 amp power, water, sewer, Wi-Fi access, and cable TV channels. The amenities at this Yellowstone RV park include a spacious pavilion which can be fully booked out for parties and special occasions, an enormous play area with monkey bars and more to help younger guests have a whole lot of fun, a main building with a convenience store and gift shop, a laundry area with over 15 individual machines, and five different restroom and shower bathhouses that are cleaned often and maintained to a very high standard. 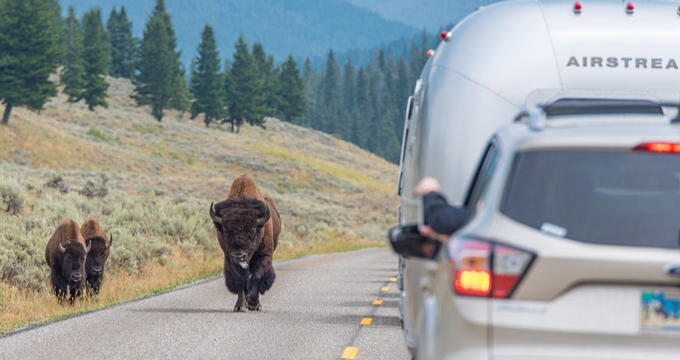 Staying at an RV park near Yellowstone National Park can be a great option, but how about if you could park your RV right in the heart of Yellowstone? At Bridge Bay Campground, that's exactly what you'll be able to do. This RV park and campground is situated right inside Yellowstone National Park, letting you admire and experience the beauty of the park directly from your RV, stepping out of the doors and landing right on the soil of Yellowstone, able to head off for hiking trails, wildlife spotting excursions, relaxing fishing sessions, and plenty more. Other RV parks in the Yellowstone area force you to drive or catch a bus to get over to the park, but at Bridge Bay Campground, you get the benefit of being right in the park, only seconds away from the banks of Yellowstone Lake itself. Another huge advantage of this seasonal RV park, which opens from May to September, is its super low rates; you can spend a night here for only $26, but the park is offered on a first come, first served basis, so you need to get there quickly. Fortunately, there are hundreds of sites to choose from and the park is also equipped with picnic tables, washing stations, toilets, and more, but you won't have the standard full hook-up facilities like electricity and water.